Home » News » Will youth say ‘I DO’ to Wedding Insurance? Local insurers have hinted of plans to start churning out covers against a wide range of eventualities associated with weddings, in a new strategy geared to lure youth into massive uptake of insurance policies. It means newly weds will now be able to shield themselves against personal accident, cancellation and failure of suppliers, costly ventures that have a potential to ruin couples happiest days. According to the umbrella Association for insurers (AKI), a significant number of underwriters have already developed the products and are ready to take advantage of the new venture to battle for market share. “Wedding has become a very major expense for the youth and some insurance companies are already working on products which could meet expenses for the youth, so you start early,” said AKI Chief Executive, Tom Gichuhi. Immediate target, he said are youths in their first year of employment with remote feelings for settling down but lacks adequate resources to meet the expenses. “That is a niche we have established, it exists,” paused Gichuhi. Sources close to six underwriters interviewed by SmartInvestor have also hinted the policy will come with different packages, each covering different levels in the wedding plan to help couples sort out most feared nightmares. Mulled levels include, cover for reception, wedding gifts, damage or loss of ring, photos and videos among other expenses. “We have realized most weddings takes a long time even two to three years to plan. This may lead to price fluctuations on goods and services on unexpected rise in interest rates, but the couples must fund this to carry on,” said an underwriter who sought anonymity. A cheap wedding in Kenya costs between Sh 100,000 to Sh 200,000, a middle class at between 250,000 to about Sh 400,000, while couples would cough upto Sh 2million for a classic wedding. Similarly they will have to pay 10 percent of the expenses to rope in an independent wedding planner, with the charges largely dependent on number of guests and location. Youths have been reluctant to take up insurance covers over what has been portrayed as bad image of policy products usually linked to death. 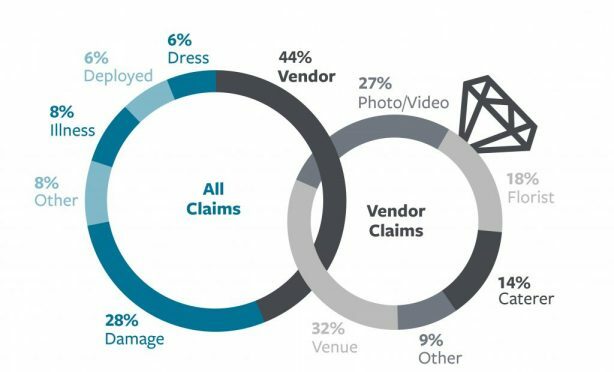 Sales marketing departments of insurers have been blamed for fueling perpetration of the dark image spanning back a decade ago, according to AKI. The negative publicity, coupled with low level awareness campaigns have further compounded growth in penetration rates with nationwide coverage now stalled at just 3.2 percent. “It is very unfortunate these sales people always made reference to death. They kept on telling people we will sell you life insurance, in case you die. Its like we are trying to sell death,” said Gichuhi. But the new drive, is expected to significantly transform the sector by attracting a 40 percent market share represented by youths through intense marketing campaigns and innovative products. “We need to bring it in as an avenue for investment and also as a risk mitigation mechanism. We need to see it from that light,” he said. Industry players according to the association have gone back to the drawing board and are coming up with aggressive strategies to lure the young generation with short maturity covers of five years and below. The strategies will accommodate youth in self employment constituting 25 percent, 30 percent in formal employment and 25 percent in Schools and 20 percent unemployed. “On way of making sure that we tap into youths in informal employment, is to structure mode of payment into flexible installments,” Gichuhi told SmartInvestor.